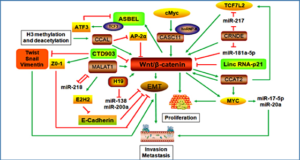 Noncoding RNAs have emerged as important regulators of cellular and systemic lipid metabolism. 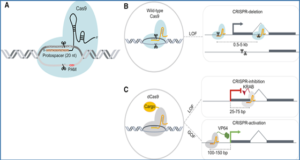 In particular, the enigmatic class of long noncoding RNAs have been shown to play multifaceted roles in controlling transcriptional and posttranscriptional gene regulation. 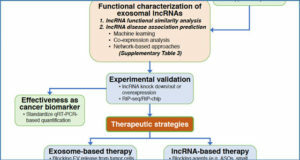 Researchers from the New York University School of Medicine discuss recent advances, current challenges and future opportunities in understanding the roles of lncRNAs in the regulation of lipid metabolism during health and disease. Despite comprising the majority of the transcriptionally active regions of the human genome, lncRNA functions remain poorly understood, with fewer than 1% of human lncRNAs functionally characterized. 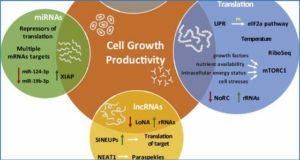 Broadly defined as nonprotein coding transcripts greater than 200 nucleotides in length, lncRNAs execute their functions by forming RNA-DNA, RNA-protein, and RNA-RNA interactions that regulate gene expression through diverse mechanisms, including epigenetic remodeling of chromatin, transcriptional activation or repression, posttranscriptional regulation of mRNA, and modulation of protein activity. 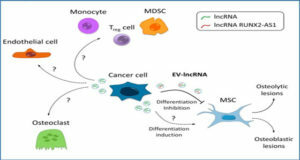 It is now recognized that in lipid metabolism, just as in other areas of biology, lncRNAs operate to regulate the expression of individual genes and gene networks at multiple different levels. The complexity revealed by recent studies showing how lncRNAs can alter systemic and cell-type-specific cholesterol and triglyceride metabolism make it clear that we have entered a new frontier for discovery that is both daunting and exciting. 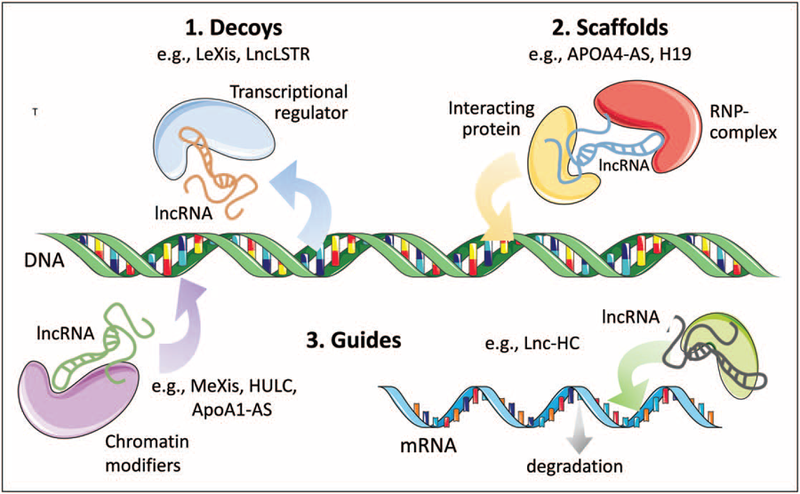 (1) LncRNAs can act as molecular decoys to move proteins away from a specific DNA location; (2) LncRNA can serve as molecular scaffolds to bring proteins into stable complexes that can modulate gene expression; (3) LncRNAs can guide chromatin modifiers and transcription factors to DNA to both repress and activate gene expression (left). 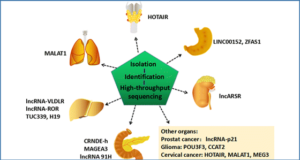 LncRNAs can also guide proteins to mRNAs and influence the stability of these transcripts. Examples of lncRNAs affecting lipid metabolism are given for each example.